Aydinbey King’s Palace & Spa and Resort is a 5-star luxury Resort and Spa situated near the beach of Turkey’s Mediterranean shore. It offers six swimming pools, mini-club, Spa facility, and full-time entertainment for the whole family. This family-friendly hotel resort proves to be a great choice for families and couples who are looking forward to spend a peaceful yet exciting vacation in Turkey. The resort is luxuriously comfortable with its excellent customer care services. Dining options at the resort’s main restaurants include a variety of buffet meals differently themed each evening. A variety of Turkish, Italian, Mexican, French, Asian and Seafood dishes are served. There are several family-friendly and creative activities organised such as gymnastics, aerobics and many water sports. An indoor pool is available that is heated in winter. Many leisure activities are offered here such as table tennis, darts, pool table, water sports and amazing entertainment shows. Free internet access is available and free parking facility is provided at nearby area. 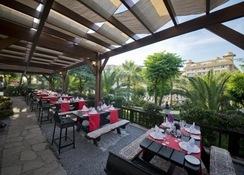 The hotel is located near the seashore in the Mediterranean region of Turkey. It is located within 10 km from Agora, Side Theatre and Side Harbour. The beach is just a few steps away from the resort. 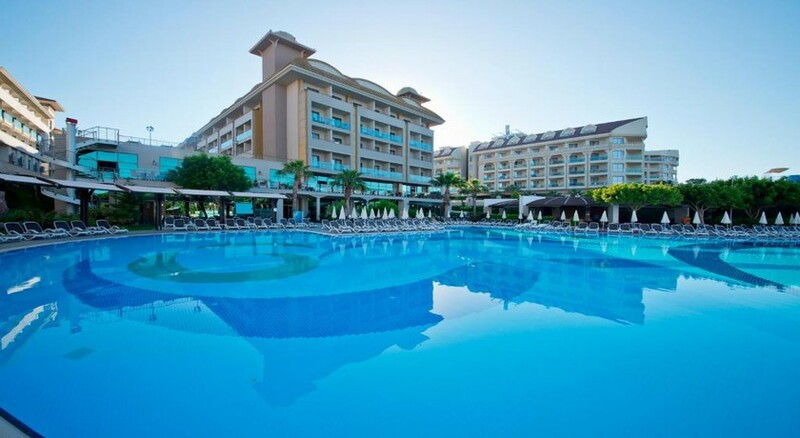 The Antalya Airport is approximately 60 km from the resort, while the city centre is 70 km away. Belek is at 25.7 km and Lara is at 41.8 km from the Resort Aydinbey King’s Palace. Accommodation facilities at Aydinbey King’s Palace & Spa include 359 guest rooms. These are divided into 311 Standard Rooms and 48 Family Rooms. Family rooms have two separate bedrooms. All rooms are elegantly designed with modern décor, they have private bathroom with WC and a balcony or terrace giving wonderful views of the pool or the sea depending on the room’s location. 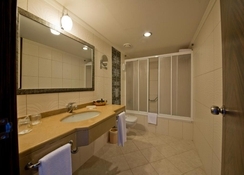 All rooms have central air-conditioning and room facilities include direct telephone, music system, satellite LCD TV, kettle, safety deposit box (hire), hairdryer and minibar. 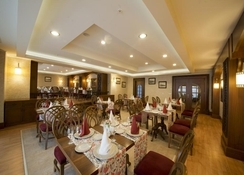 The main restaurant at the hotel is known as the King’s Restaurant, which serves delicious feasts in a buffet style at breakfast, lunch and dinner. The buffet meals are differently themed every evening in both indoor and outdoor dining areas. Theme dinners include Turkish, Italian, Mexican, Asian, French and seafood dishes. There is also a smaller Restaurant serving a variety of Turkish Cuisine each day and a Gozeleme option for Turkish street food lovers. The resort also offers 5 high-quality à la carte restaurants and three snack bars. Additionally, there is a pool-side bar, a lounge bar, a beach bar and a disco bar serving refreshments, cocktails and light snacks all day. 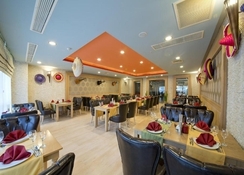 All-inclusive dining includes breakfast, late breakfast, Gozleme, lunch, ice-cream, afternoon, dinner, midnight snacks and drinks all served in varied timings. The resort has a total of 6 swimming pools. These include two outdoor pools for relaxing, one indoor pool (heated in winter), a pool with waterslides, one kid’s outdoor pool and an indoor pool for kids. 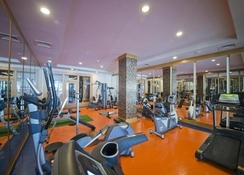 Fun and leisure activities include table tennis, Ping-Pong, pool games, bike (rental), darts, aerobics, gymnastics, fitness centre and much more. There is a mini club that arranges fun-filled and exciting activities for children (ages 4-12 years). Amazing entertainment programs are held throughout the day and in the evening. Guests can also head towards the beach where a lot of exciting activities such as beach volleyball and many other water sports. Sun loungers are provided at the beach where guests can lie back and relax under the sun. Towels and parasols are also provided by the hotel management. There is an astounding Spa and Wellness Centre where Sauna, Turkish bath, steam bath, beauty treatments, hairdressing and massage facilities are provided.